Every company that holds a current ISO 9001:2008 certificate will need to demonstrate that they meet the new requirements of ISO 9001:2015 in order to maintain certification. Companies have until September 2018 to come into compliance, though many Certification Bodies will refuse to issue new certificates to the 2008 version after September 2016. The DESARA Group can work with you to maximize the positive impact of your transition efforts while minimizing the stresses of planning and implementing changes. What are the main changes? How much will we have to do to stay certified? The fundamental intent of ISO 9001 remains the same, so the changes may look insignificant on first reading. Many requirements have even kept the same wording although the numbering scheme of ISO 9001 has changed. A few requirements have been deleted and others added. Some terminology has changed, and concepts that were not strictly required in past versions have been emphasized. Some organizations may look at ISO 9001:2015 and decide they don't need or want to make many changes at all: either they are already meeting the new requirements in their existing practices, or they will choose to do as little as possible to convince their auditors that they comply with the new revision. Smart businesses will use the ISO 9001:2015 transition period to evaluate the underlying principles for effective business operations that are built into the model. Leaders will strengthen the link between quality and overall business strategy. Managers will systematically identify risks and opportunities that help reduce costs and build revenue. Organizations will build greater commitment to operating efficiently, collaborating with suppliers, and serving customers more effectively. DESARA can support your business to get the most from your ISO 9001:2015 transition. Why was ISO 9001 revised? ISO reviews all standards every 5 years to determine whether revisions are needed. They made a decision several years ago to use a common framework across management systems. ISO 9001:2015 uses the new consistent numbering system, vocabulary, and common wording of requirements, which benefits organizations that are certified to multiple standards across different industries they serve. In addition, the authors of ISO 9001:2015 acknowledged that business practices have evolved in important ways since the last major changes were made to ISO 9001 in 2000. For example, many companies now rely on outsourcing much more than they did 10 or 20 years ago. How are organizations going about ISO 9001:2015 transition? Certification bodies are not allowed to provide consulting services to their clients (ref. ISO 17021). That is, they can teach a generic body of knowledge, but they cannot customize it to your specific situation lest they lose objectivity when it comes to conducting certification audits. They can point out gaps between current practices and requirements on gap assessments and pre-certification audits, but they are prevented from offering any concrete support for addressing findings. During the 3-year transition period, most organizations will gather information on the changes, determine the changes they need to make, and get to work changing documents and practices. Once their internal auditors believe the system complies with ISO 9001:2015, they will have their CB conduct a transition audit and if everything is as it should be, they will receive a new certificate. The transition process can take anywhere from a few months to the full length of the allowed time, depending on the effectiveness of the people working on the project and the priorities of the business. Understanding the intent behind the changes in ISO 9001:2015 is key to benefitting from the transition process. 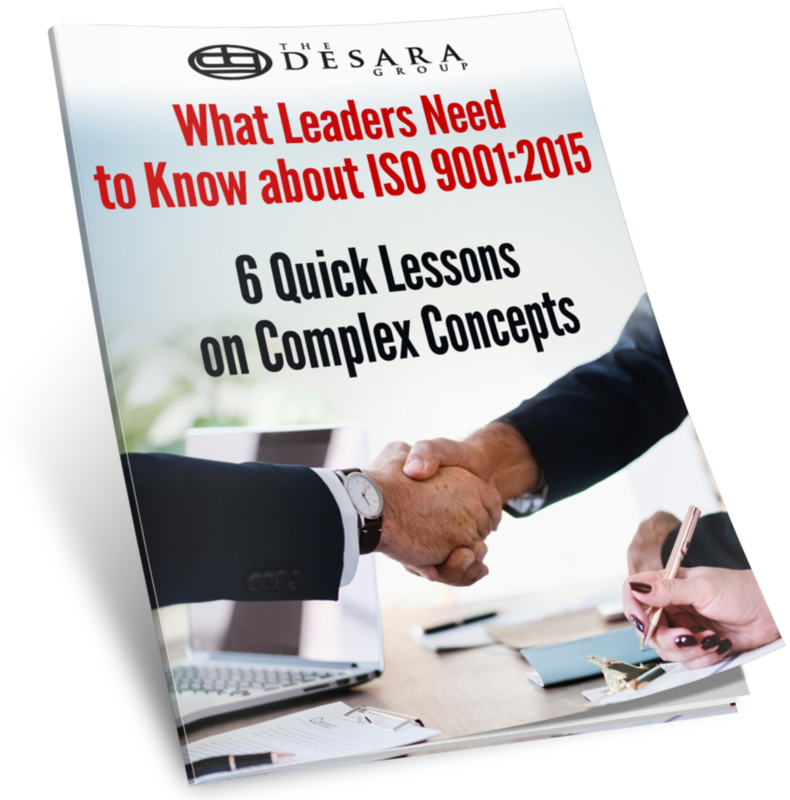 Because DESARA has participated in the revision process of ISO 9001:2015 as well as TL 9000 through our involvement in the US TAG to ISO/TC 176 and QuEST Forum, you can rely on our team to give you deep insight and to assist you in guiding your organization through the changes. Organizations with mature, well performing quality management systems and plenty of resources to work on the transition may need minimal outside support, such as education for leaders and workshops for internal auditors. Other businesses may recognize that a higher level of outside support will go a long way toward making sure they stay focussed on using this transition period to truly upgrade their practices in a meaningful way. DESARA consultants have helped organizations of all sizes implement management system standards for over 25 years. Our proven model will allow you to reach your goals on time, on budget, and with the maximum business benefits. Let's schedule a conversation about your transition options.